Stuck inside on a cold November day, Magic was laying on the floor in the living room next to a large picture window watching TV. Magic is a Labrador mix breed dog with a strong prey drive. She enjoys watching TV especially Westminster, Animal Planet, and National Geographic! The photograph was shot in natural light, the background removed to isolate and enhance her face and eyes. This emotional image of draws attention and quickly became one of my most popular artworks. The original photograph was rendered into a digital painting for improved resolution and quality. Search: nature, animals, pets, dog, cute, breed, outdoors, framed art, rollosphotos. When we drove from central NY all the way to Columbus OH to adopt this little puppy I had no idea what a wonderful addition to our family he would be. Golden’s have one of the best temperaments. They are friendly, loving, reliable, confident, and intelligent. If you are considering a new pet, check your local shelters first. There are lots of loving dogs in need. 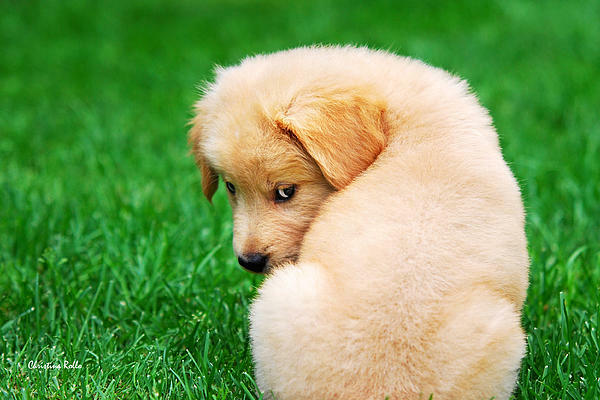 Adorable Golden Retriever puppy sitting in green grass looking over his shoulder, after exploring his new environment for the first time. His gentle loving eyes, cute button nose, and curious nature won me over immediately. This puppy was rescued from a high-kill shelter. I was eager to adopt him and provide a loving home. Adopting any pet requires a long-term commitment, a decision which should be considered carefully. The Golden Retriever is always eager to please, like posing for this photograph. 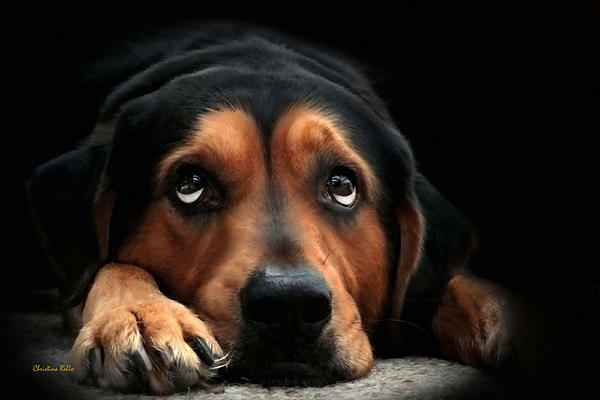 Dogs are social animals who will enjoy your companionship, and make wonderful friends. The soft fuzzy coat of this breed makes them one of the best dogs to snuggle up to. 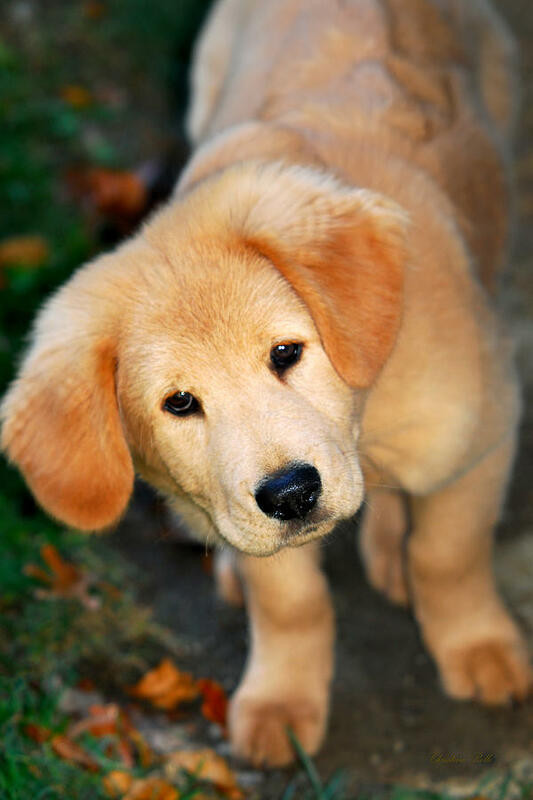 Golden Retriever coats are light golden to dark golden in color. 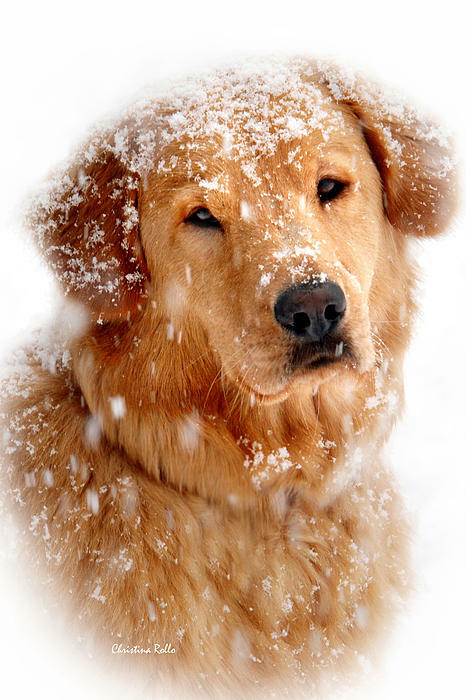 Their topcoat is water-resistant and slightly wavy, the undercoat is soft and keeping the retriever cool in summer and warm in winter. Browse more pet portraits from my entire collection of fine art. Search: Dog, animals, cute animals, canine, companion, golden retriever, portrait, golden, brown, playful, friendly, gentle, mammals, outdoors, puppy, retriever, puppies, framed art, fur, pet photography, rollosphotos, purebred, breed.